This rare resource is necessary for crafting and completing an early quest, but it can be hard to know where to acquire it. If you've just started playing Anthem, you might be frustrated trying to find Ember, one of its rare crafting resources. 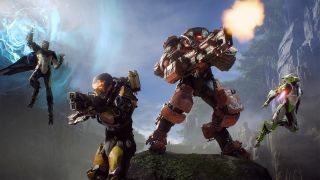 Crafting your own gear is one of the best ways to get new loot in Anthem, but Ember can be a little tricky to find for new players because the game doesn't really explain where to look. Don't worry, we got you. Early on in the story, you'll meet Prospero in the Fort Tarsis bazaar, a merchant who deals in cosmetics and gear for your javelin suit. Before you can unlock the crafting capabilities of the Forge, Prospero needs you to find three Embers out in Bastion, Anthem's open world, using the free-play mode. Where to find Ember in Anthem? It's actually really easy, but it's completely understandable that you might waste time flying around looking for the stuff. The truth is that Ember is actually everywhere and is often given as a bonus item from various loot-dropping activities. One of the best places to get Ember quickly is to harvest it from resource nodes scattered around the map. Every resource node you find has a chance to drop Ember. You can also sometimes get Ember from breaking down unwanted equipment—but early on you're likely to not have a lot of that laying around. Another source of Ember early on is world events that periodically spawn around Bastion when in free-play mode. If you spend a few minutes flying around, you'll eventually get a notification of an event nearby and can head there. Completing the event will usually reward you with some. For new players, that should be more than enough to get started so you don't waste time like I did flying around the map thinking Ember was a unique resource node. There are higher rarities of Ember that are necessary for more powerful gear, and we'll update this guide as we discover learn more.